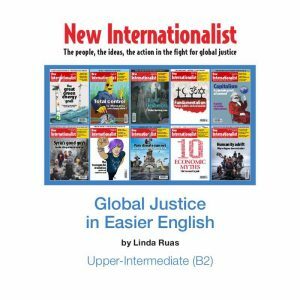 Global Justice in Easier English: Upper-Intermediate is part of a series of three short booklets of about 42 pages, at levels Pre-intermediate (A2), Intermediate (B1), and Upper intermediate (B2). Each booklet includes 6 units constituting approximately 2 hours of classroom work. These units are cognitively challenging, culturally varied, and oriented towards adolescents and adult learners. Each unit centres on a powerful topic that is likely to stimulate older teenagers and adults in various English language learning contexts. For example, Global Justice in Easier English Upper- Intermediate’s six units are: ‘Deforestation’, ‘Ability and Disability’, ‘Transgender’, ‘The Organ Trade’, ‘Development’, ‘Charities and NGOS’. Some of these topics are seldom covered in coursebooks. This booklet will therefore be a welcome resource for a teacher looking for ideas and activities that will genuinely engage students with up-to-date, real world concerns. Moreover, this particular Upper-Intermediate booklet, along with the other two in the series by Linda Ruas, is designed very flexibly, with a comprehensive answer key to all exercises; it can thus be used for self-study, and/ or for work in class. Each of its 6 units integrates the skills of listening, speaking, reading and writing, and has a ‘focus on language section’; for example, there are exercises on prepositions, and articles (unit 1), the language of statistics and comparisons (unit 2). Concise explanations of all language points, such as the form and function of conditionals (unit 6, p.32) are provided at the back (pp.41-42). These explanations of the grammar rules are linked to the themes of the reading texts in each unit. Learners are also encouraged to observe lexical patterns and grammatical structures in the context of the readings. A teacher or student need not follow the units chronologically, but in accordance with the topic that most interests them and which is most appropriate to their particular syllabus or scheme of work. It is also refreshing to see that there is a good range of tasks and that the units differ in terms of both task types and topics. Nonetheless, some popular activities, such as cloze exercises, quizzes, discussion tasks, finding errors in extracts and correcting them, are repeated in more than one unit. All of the readings have been taken from the current affairs magazine, New Internationalist and made ’easier’ or abridged in the 6 units by reducing the vocabulary and range of syntactical patterns and grammatical structures that were in the original texts. However, teachers can freely revert to all of the original articles by going to newint.org This offers a further opportunity for teachers to introduce such stimulating materials to their learners (in one-to-one or group sessions) for extending their vocabulary and knowledge of current affairs. Being able to compare the abridged and complete version of each article can also be exploited for ways of teaching paraphrasing, summarising and editing skills in an English for academic purposes (EAP) lesson with multilingual university students. Not only would Global Justice in Easier English Upper-Intermediate be very useful for teachers working on university pre-sessional EAP courses in the UK this summer, but it would also be very useful for any teacher delivering intensive EFL programmes and looking for ways of integrating project work on their English courses. For instance, after watching a short video on the Brazilian Ka’apor community’s fight against loggers (Unit 1 p.4) Ruas (2016) suggests students ‘research other areas of the world where there is deforestation.’ In this regard, learners can also be encouraged to use the complementary newint.org. Indeed, all three Global Justice in Easier English booklets work best together with the visuals and sample lessons from the related, free online wiki: there are more than 75 free Ready Lessons, on powerpoint and PDF, that can easily be adapted by teachers. In sum, Global Justice in Easier English: Upper-Intermediate is an economical, labour-saving, creative and cutting-edge resource. I look forward to delving into it further with my students.